Volkswagen is running some special PCP finance offers on Tiguans and Touaregs from 13th to 27th February, including 3 years servicing included in the price. VW's compact SUV, the Tiguan, is available with a deposit contribution of up to £2,750**, and monthly payments on Solutions PCP (Volkswagen Financial Services’ personal contract plan) from £265 and 4.9 per cent APR representative. All Tiguan Match and R-Line models now benefit have standard touchscreen satellite navigation. Protection Packs, comprising front and rear mats, a boot mat and mud flaps are also available to ensure the new car stays looking new for as long as possible. On the VW Touareg (new last August) there are savings up to £5,000** off the list price of the car. 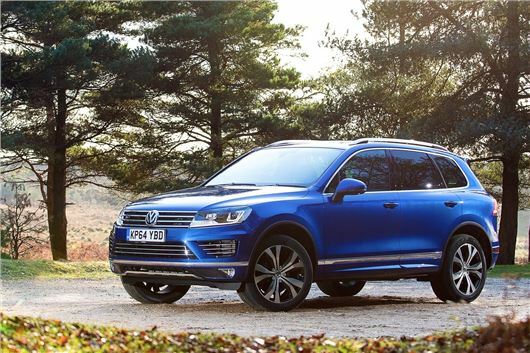 The Touareg available on Solutions, with monthly payments from £459 with 7.0 per cent APR representative. A bespoke Protection Pack is also available for the Touareg. For full details, terms and conditions, finance examples or to find your nearest participating Retailer, please go to www.volkswagen.co.uk. * These prices reflect the Volkswagen UK tactical discount available until 31 March 2015. £5,000 discount offer is available on all 262PS engines regardless of trim, 204PS engine is offered at a £3,000 discount. #At the end of the Solutions yerm there are three options: i) retain the vehicle: pay the optional final payment to own the vehicle; ii) return the vehicle; or iii) replace: part exchange the vehicle, subject to status. **Deposit contribution is available when purchased on Solutions Personal Contract Plan. Free servicing is available up to 3 years/30,000 miles (whichever comes first) when purchased on Solutions Personal Contract Plan. Offer available for vehicles ordered by 27 February 2015 from participating Retailers. Retail Sales only. Available to 18's and over. Further charges may be payable if vehicle is returned. Offers are not available in conjunction with any other offer and may be varied or withdrawn at any time. Subject to availability. Terms and conditions apply. Finance subject to status. Accurate at time of publication [09/02/2015]. Freepost Volkswagen Finance.